Grilled cherries and greek yogurt flavor this sweetly wholesome breakfast treat. The first bag of cherries to enter our house gets demolished in a matter of hours. My daughter and I have had pit spitting contests, the kitchen trash becomes a spittoon, and my spouse always seems to step on the sole stem that ends up on the floor. Our whole family enjoys fresh cherries, so when they go on sale at the local grocery store I buy them. And buy them, and buy them, and buy them. After a few bags, I'll looking for other ways to enjoy fresh cherries. I've chopped them up with peaches to make a fresh (i.e., not canned) Cherry Peach Salsa. I've tossed them in smoothies. Most of the time, though, I pop them in my mouth, one after another. 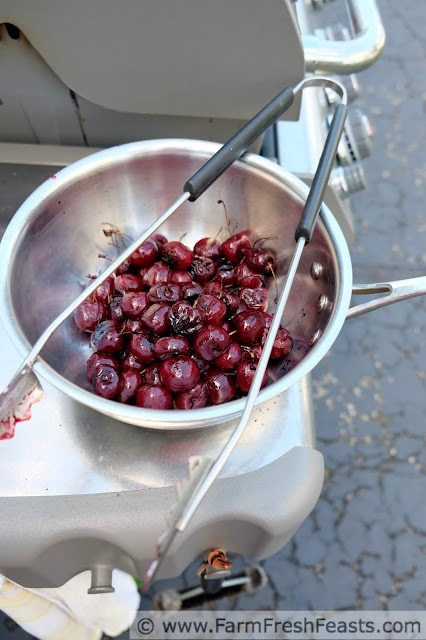 Last summer, while having a blast with our new grill, I grilled cherries. Game changer! If you haven't grilled cherries, you should. They are totally tasty and exceptionally easy. Rinse whole cherries (stem and all), toss into a bowl, splash with a bit of cooking oil to coat . . . and they are ready to go on the grill. How easy is that? I used my grill basket, and had my gas grill preheated to medium heat. Stirring occasionally, my cherries were grilled in 8 to 10 minutes. After you take the cherries off the grill, pick up the stem end and pop the (slightly cooled) cherry in your mouth. Yum! Spit out the pit (heck, you're probably outside already) and enjoy that buttery goodness a moment longer. It's not exactly like a bite of cherry pie filling, but it's on the spectrum. 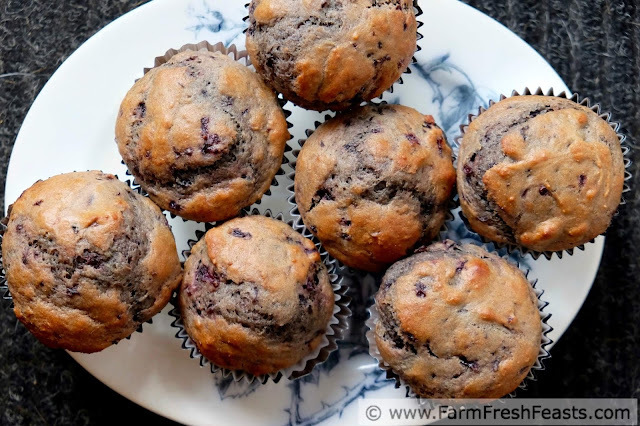 Once you have eaten your fill of grilled cherries (and before that, your fill of fresh cherries), save the rest for these muffins. 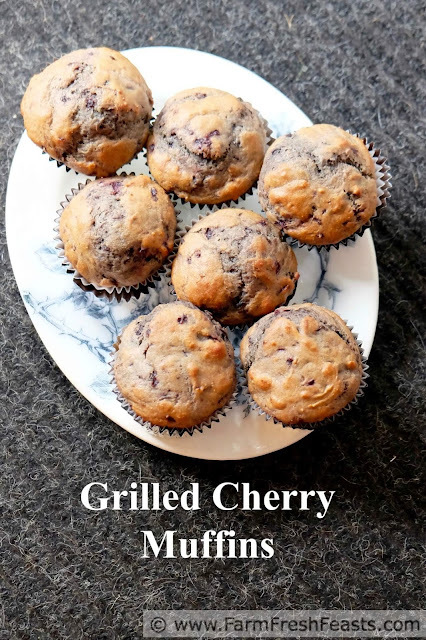 Since the texture of cooled, pitted, grilled cherries is somewhat similar to applesauce or cherry pie filling, I looked in my muffin mentor Muffins: A Cookbook (Amazon link, not affiliate though) for inspiration. This cookbook was written by a couple of school chums of my mom, and I like to refer to it whenever I'm trying something new. 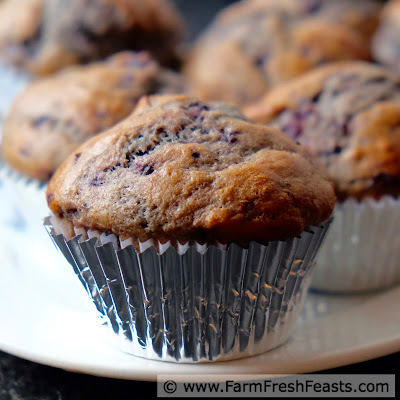 I adapted the Cherry Surprise muffin recipe found in the cookbook. I swapped in grilled cherries for the pie filling, I combined the cherries with the liquid ingredients, I subbed some vegetable oil instead of all butter, some whole wheat flour instead of all all purpose flour, and switched to brown sugar because I had a bunch on hand. For more recipes using cherries, please see my Cherry Recipes Collection. It's part of the Visual Recipe Index by Ingredient, a resource for folks like me eating from the farm share, the farmer's market, the garden, the neighbor's garden, and great deals on ugly produce at the grocery store. Note: this recipe calls for grilled cherries. As described above--toss whole fresh cherries with a splash of vegetable oil and grill over medium heat for 8 to 10 minutes. Cool, pit, and chop. If you haven't grilled your cherries, go do so. I'll wait. You should probably double or triple the amount you're grilling since you're going to want to eat some of them. Preheat the oven to 400 degrees Fahrenheit. 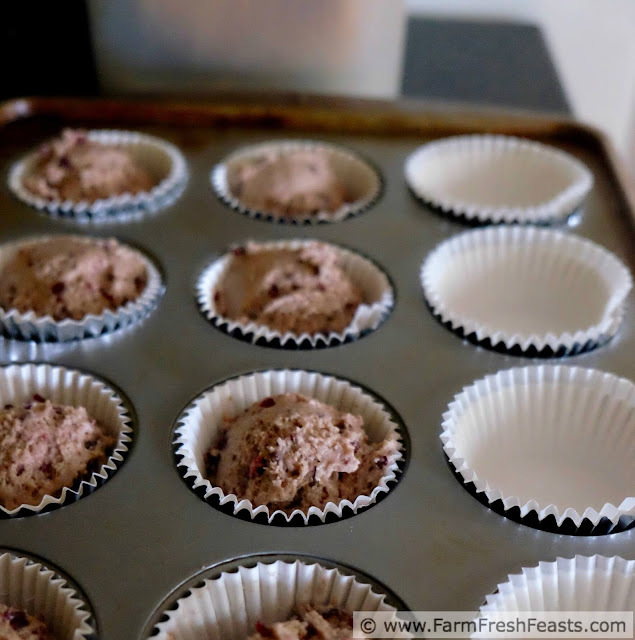 Spray a 12 well muffin pan with oil spray, or line with paper liners. Or get all fancy like I did with the paper/foil combo. Which seems like overkill to me. In a large bowl, whisk together egg and yogurt. 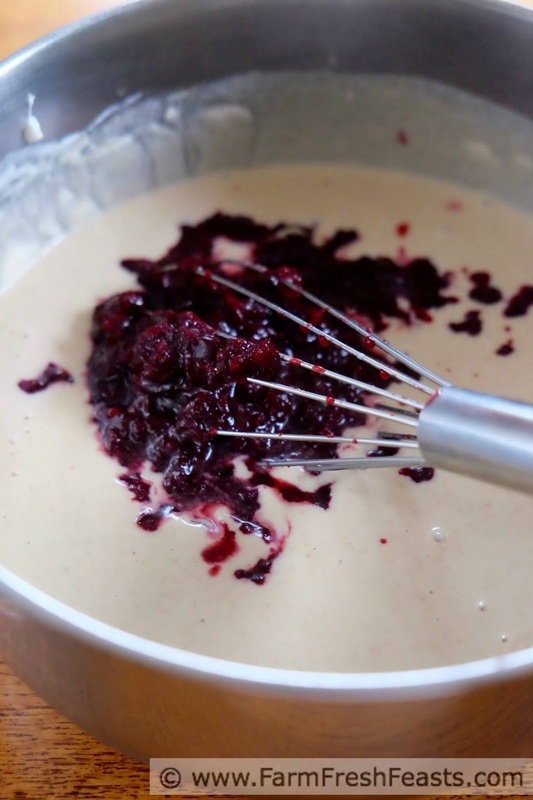 Whisk in the fats, vanilla, milk and brown sugar until thoroughly combined. Dump the chopped grilled cherries on top, and stir to combine. Dump the remaining ingredients on top of the cherry mixture and stir until just mixed. The batter will be rough, and that's OK.
Bake for 15 minutes at 400 degrees Fahrenheit. Cool in pan for another 5 minutes, then transfer to a rack to finish cooling. What are you waiting for? 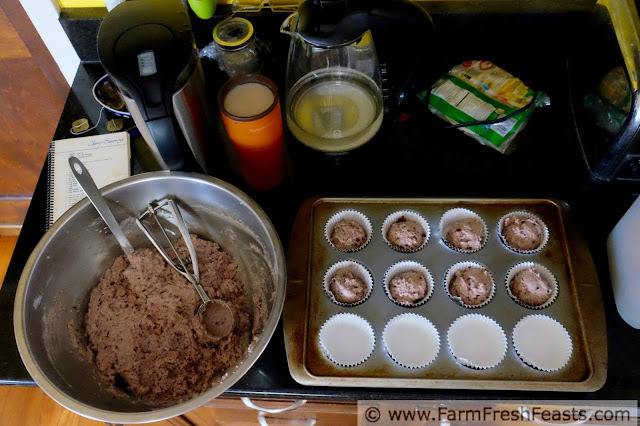 Get cherries, get grilling, and let's make some muffins! Why? 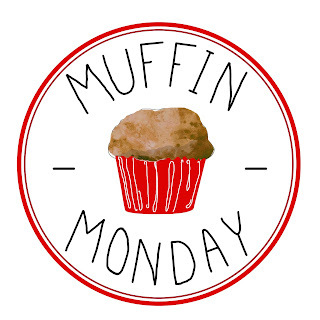 Because it's Muffin Monday, that's why! Here's what we're baking up this month! I couldn't wait to see these, Kirsten! Grilling cherries really is a game changer. I don't think I'll ever have enough leftover to make your lovely muffins. I really wish the abundance of fruit happened at a time OTHER than the abundance of everything else, so I could pace myself a bit! As it is, I'm scrambling to eat up or put up all the produced barely have a glance for fruit. I cannot believe it occurred to you to grill cherries. What an ingenious idea. I cannot wait to try it. Thanks Kirsten. After years of having a tiny, portable, grill it is lovely to have the surface, and the cooking power, to play around. And play I have been! My neighbors come over every time I grill to see what new thing I'm throwing on it this time. I feel bad if I'm only doing some burgers and squash--nothing exciting. Grilled cherries? Wow. I can just imagine that it's an amazing concentrated flavour. Wow! Just Wow!! I love cherries too, and buy them and buy them and buy them. Grilling them never occurred to me, and now I want to go buy a bag and fire up the grill. Like, right now!! This is so clever!! I never thought to grill cherries! Probably means I should invest in a grill basket so I don't lose them through the grates. Looks like a delicious muffin! Oooh I need to grill some cherries. Next bag because the first one is already gone, eaten just the way you and your daughter go through cherries. 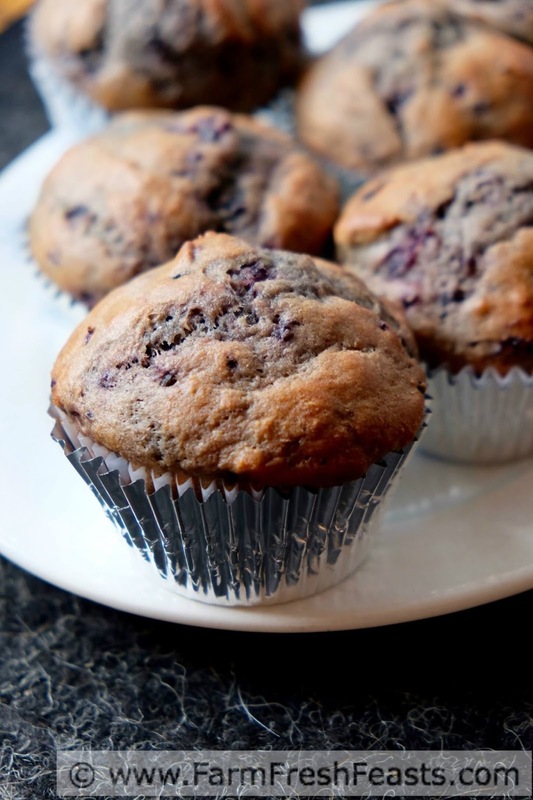 These muffins sound heaven sent right now. I am definitely saving this recipe! I've roasted cherries before and they were incredible, so I can imagine grilling them is also awesome.